Body Talking goes crazy this time and brings you Funky Edgy, a new set of 10 poses perfect for those times when you have to go a bit further and experiment with poses. Funky Edgy is a set that works for both runway and photoshot due to the smooth transitions between poses as all the Body Talking creations have. You can get Funky Edgy at the Body Talking CoF Mall as a fat pack or in individual poses. 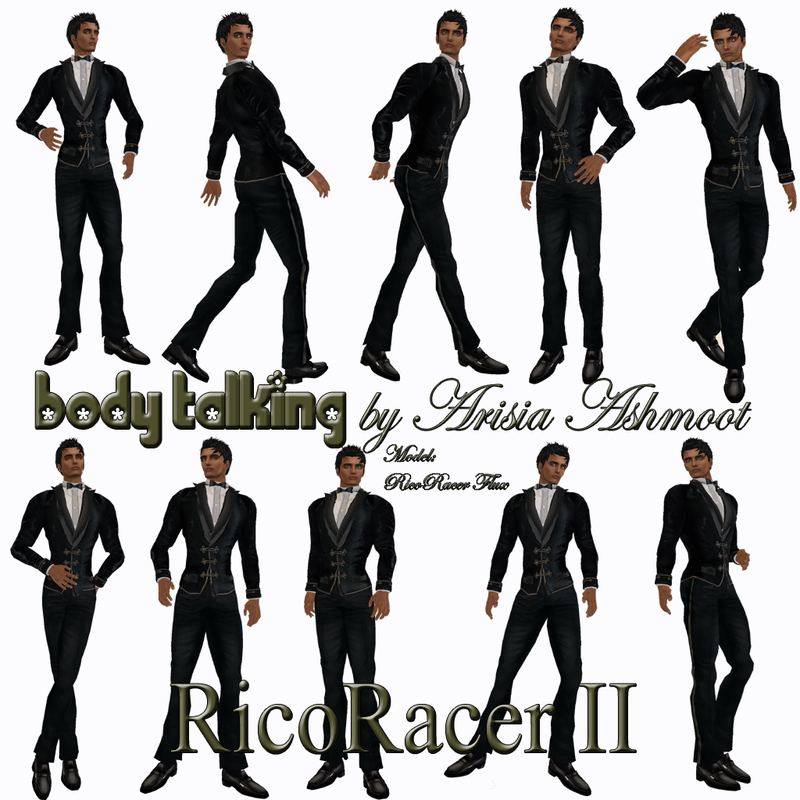 Body Talking has tough again in our handsome male models and is releasing RicoRacer I and RicoRacer II. RicoRacer is a couple of 2 male sets fun, chic and versatile because it has a bit of everything so it can work since a casual to a classy outfit. Body Talking has made a set that is again perfect for both runway and photoshots, due to it has smooth transitions, as all Body Talking creations have. 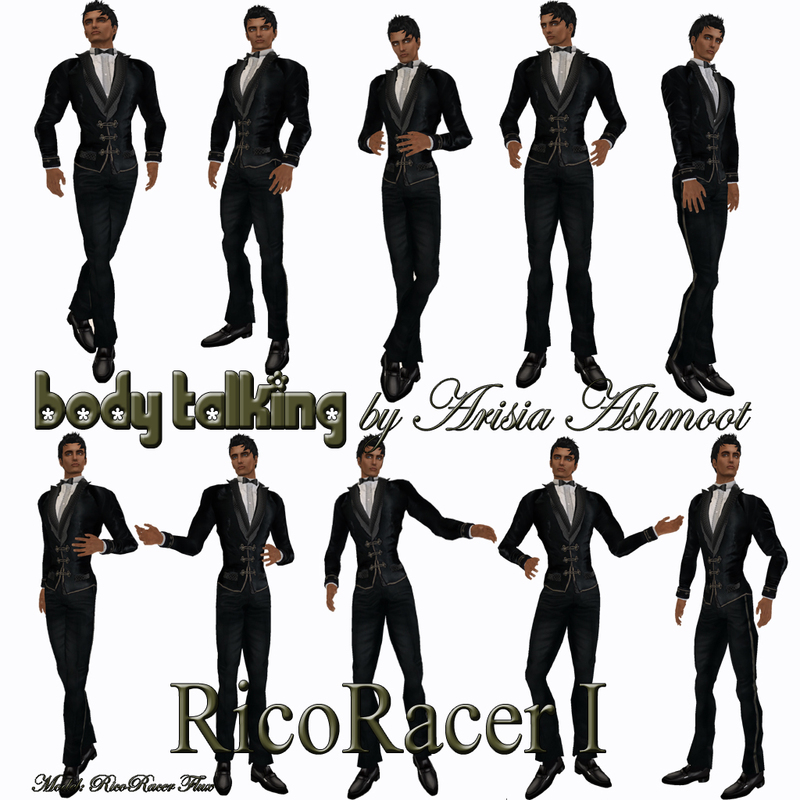 RicoRacer is avaliable in 2 fat packs or in single poses at Body Talking CoF Mall. Body Talking shows its powerful face with our new set, tandra; a set of 9 poses to show your feminine but strong side. Tandra is a set that goes perfect with those high fashion but cassual outs, because it gives them a special touch. As we know, not all the shapes are similar, Body Talking has made some variations of few of the poses so it will be easier for you to fit the outfit you need to show. The variations of tandra are avaliable by single poses, are not part of the fat pack. As all Body Talking creations, tandra is perfect for both runway and photoshots, due to its smooth transitions. Inspired in a dark night when a pretty girl is kept captive in chains by her two high fashioned guards, Body Talking brought to life Darkness. Darkness is a group pose set that also comes with the individual poses in the pack.